The Reggie Lewis Center will be occupied this weekend with the annual Coaches Invitational. The small schools will contest on Saturday, while the large schools will battle on Sunday. On Saturday, there's several events to keep an eye on. The 55-meter dash looks like it will be decided by a lean. The event features Oakmont's John Caouette (6.45 seconds), Milton's Smith Charles (6.45) and Catholic Memorial's Ore Ojo (6.5). Look for Charles to score quite a few points. He recently ran 6.9 for 60 meters at the Greater Boston Track Club Invitational, a meet he also leaped an all-time best of 23 feet, 6.75 inches for the long jump. The versatile junior is also one of the favorites in the high jump where his 6-6 best matches the top effort of Medfield's John McNeil. McNeil's teammate, Noah Garfield is the No. 3 seed at 6-5. Medway's Ava Vasile is the No. 1 seed in both the girls' 55m hurdles (7.49) and the 300m (39.84). In the longer race, Vasile appears to have her toughest challenge with Bromfield's Chloe Alfieri in the field. Alfieri comes into the race with a near sub-40 second best of 40.13. The boys' 300m could be a nail-biter, featuring four speedsters that have broken 36 seconds - Archbishop Williams' Sean McAnulty (35.23), Watertown's Mange Camara (35.44), Catholic Memorial's Christian Denny (35.71) and Oakmont's Caouette (35.97). Weston's Peter Diebold leads four that have broken 1:25 in a loaded 600m boys' race. Diebold has a best of 1:23.80. He recently clocked a fast 1:06.50 for 500m, an effort that earned him seventh overall at the New Balance Games in New York. Milton's Bridget Mitchell is the overwhelming favorite in the girls' 1,000m. Mitchell has a season best of 2:58.64, which she did at a Bay State Conference meet last month. She clocked a PB of 2:54.31 to win last year's All State Meet out of the unseeded heat. Lynfield's Kate Mitchell (no relation) could challenge early. She has done 3:03 this winter. Amherst-Pelham's Aiden Foucault is the top seed by three seconds in the boys' 1K with a 2:34.55 best. Wakefield's Matt Greatorex and Amherst-Pelham's Jack Yanko are the 1-2 seeds in the boys' mile with best of 4:23.41 and 4:23.41, respectively, for the eight-lapper. Littleton's Kaitlyn Roffman leads the girls' field with a 5:06.73 effort. In the two mile, Hopedale's Brandon Hall (9:43.33) and Amesbury's Drew Everett (9:48.0) are the top seeds in the boys' race. Littleton's Sarah Roffman (11:03.23) and Amherst-Pelham's Sophia Jacobs-Townsley (11:12.0) are 1-2 in the girls' race. Could we see a 60-footer in the shot put? Innovation Academy's Aiden Felty will give it his best effort in this event. He enters the circle with a 57-4.45 best. The girls' event with include Seekonk's Cameron Garabian (40-1.25) and Dennis-Yarmouth's Tiana Bazie (39-4.5). Don't be surprised if we see several national-caliber performances at this meet with loaded fields in multiple events. Fresh off her nation-leader for 800m, Acton-Boxborough's Samantha Friborg is entered in three events - 600m, 1.000m and the mile. The odds are favorable she'll pick two of these events on Sunday. Whatever she does, plan for some fast times. Friborg won the 800m at Yale this past weekend with an indoor best 2:10.26. She brings a 1:33.69 effort to the 600m, a time she should be able to improve on with fresh legs. The mile could be one of the races of the day if Friborg toes the line there. 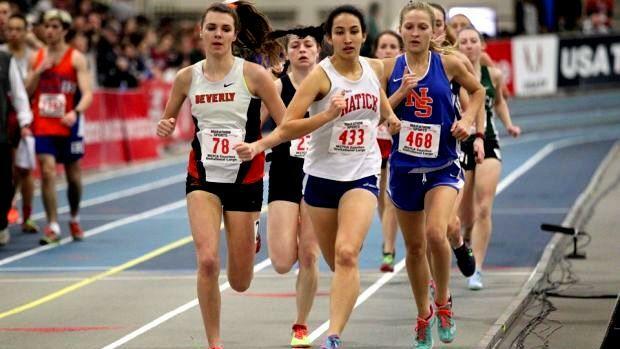 She'll be matched against Natick's Grace Connolly, who has a best of 4:52.38, which she did to place sixth at last year's New Balance Nationals. Friborg was third in the mile at the Dartmouth Relays earlier this month where she ran 5:04. But after her win at Yale, her confidence has to be sky high and she'll be raring to go against a runner of Connolly's caliber. The race will also feature Newton South sophomore Lucy Jenks, who will more than likely be eyeing a sub five-minute effort. She did 5:02 as a ninth-grader. Friborg is the No. 1 seed by a substantial margin in the 1K where she has a PB of 2:51. But with another race more than likely under her belt, it should be a much closer affair down the stretch, especially with runners like Concord-Carlise's Sarah Reichheld (2:58.87), Woburn's Alexina Hurley (3:00.96) and Connolly (3:01.22) in the race. The boys' mile appears as though it might be a solo effort by Arlington's Ryan Oosting, who has a 4:14 best and recently clocked 4:15 to anchor his team to a first-place finish in the DMR at the recent State Relays. The two mile should be a bit different. The race features several that could break the tape at the end, including St. John's Prep's Tristan Shelgren, Brookline's Lucas Aramburu, Newton North's Andrew Mah and Oosting; all are capable of running sub 9:20 this weekend. Oosting owns the fastest of the bunch with his PR of 9:05 for outdoor. He has done 9:12 on the indoor surface. Will we see a sub 35-second effort in the 300m? It could happen. Somerville's Phillips Magre has potential for that milestone. Magre is fresh off his victory in the 400m at last week's Yale Track Classic where he ran 48.97. He goes into Sunday's race with a best of 35.09 and should be challenged by a worthy contender in Davonte Burnett of Needham, who dominated the 100m and 200m races during outdoor last year with state and New England titles. Magre should secure the high jump crown where he owns a PB of 6-8 and a season best of 6-5. The girls' high jump could be a preview of next month's All State Meet. The event includes defending champion Zoe Dainton of Hingham, who has a best of 5-8. There's also Wellesley's Julia (5-6) and Anna Jordahl Henry (5-6) and Hingham's Lila Belsher (5-4), who are all capable of taking individual honors. Promising freshman Sara Folan of Andover is the favorite in the long jump where she has already surpassed 18 feet this season with a best of 18-3. Five other leapers in the field have broken 17 feet. Acton-Boxborough;s Aiden Young is No. 1 in the boys' event with a 22-4 effort. Last year's state runner-up Theo Burba of Newton North will be locking horns with Lexington's Thomas Lingard in the boys' 600m. Burba clocked the top sophomore time in the country in 2017 with his PB of 1:18.87. Thus far this winter he has a season best of 1:22.08. Lingard, last year's 1,000m champion, ran 1:21.91 in a Middlesex league meet back in December. The odds are favorable for a new state-leader in this event. Right now, Calvin Perkins of Belmont owns the fastest time. He edged Lingard in last month's league meet with a 1:21.42 effort.